It’s easy to spend your life worrying about the momentary interactions that may define other’s opinions of you, and in the end won’t matter. It’s much harder to live your life focusing on making a difference for the betterment of others, one that could transcend many lifetimes. What will you spend your life on? I read other’s emotions the way some people read signs on a highway, I can’t always understand them, but I see them (and feel them) nonetheless. So what does this have to do with being awkward? I care entirely too much what others think of me. But while this makes some people superficial, it just makes me super-awkward. I haven’t stopped being me at any point in my life, if anything my blunt responses to the negative emotions of other’s have only made me more unique. I used to switch schools alot when I was younger, and no matter where I went, I always struggled to connect with my classmates. In eighth grade, I made my first friends at a new school by making my awkwardness work for me. The kids in public school found my neon pink shoes appalling, so I made friends by asking them for whiteout. How? I told them it was the only thing that could cover up my obnoxiously bright shoes. I have and, likely always will, value my connections with others, above my own pride. Sometimes this is a good thing, other times not so much. But over the years I have learned to use natural awkwardness to my benefit. I know I’m different. I know my fashions are rarely in trend, and my smile is a bit too big, but I keep smiling and styling to my heart’s delight anyway. When you’ve lived one sort of life for so long, it’s hard to start anew. I got my wish two years ago, for a better life with less pain and struggle. But instead of making myself better for it, I lost all the strength that I’d been grasping tightly for so many years. I didn’t know what to do with myself any longer. I had been holding on, and for the first time I let go, and I found myself spiraling. It was like nothing bad had ever happened. I felt that if I was lucky enough to escape the cause of my pain, I should just be grateful and happy. But it had happened, and I wasn’t the same now that I was on the other side of it. I am speaking in vague terms, so as not to upset those that caused my pain, as all I ever wanted was for them to make it through their own personal struggles. However, as they overcome their addictions, I developed one of my own. An addiction to sadness. 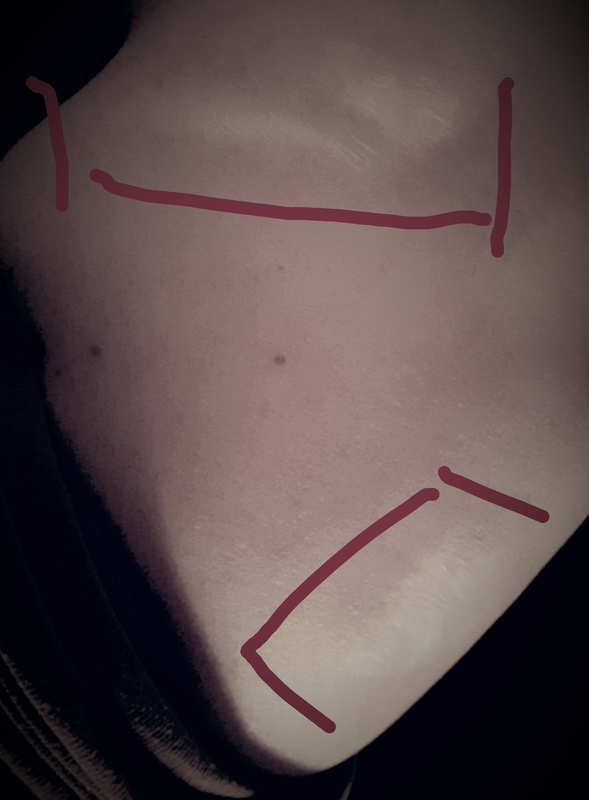 I like the physical scars on my body. They remind me of what i’ve been through, what I never want to go through again, and my will to overcome. Many things can be forgiven, but not all should be forgotten. Visual art is a mysterious gift. This morning I was looking around the “man-cave” (otherwise known as the room my mother avoids at all costs), and one of the pictures on the wall caught my attention. 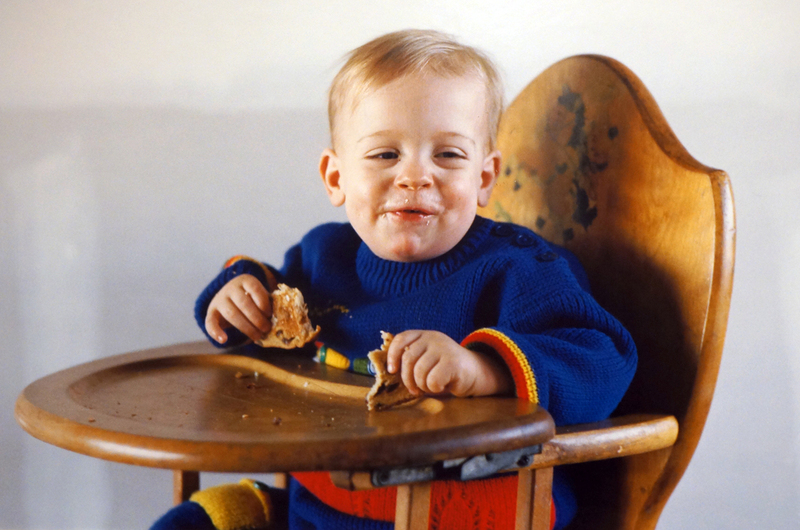 It is a photograph of my older brother when he was maybe two years old, sitting in a highchair with two pieces of cinnamon raison toast, rather daintily held in his hands. What makes this photo genius is the expression on his face as he looks at someone or something entertaining him in the room. The photo is just of him, so there is no way of knowing what sparked the childish joy on his face. However, his lips are pulled together in an amused smirk, and his eyelids are scrunched in the natural way they react to his smile. He is clearly trying to suppress full on laughter, which he is most definitely on the verge of releasing. His face is turned to the right of the cameraman (my father), giving the viewer a feeling of uninhibited reality. He was not posing for a picture; he was enjoying the moment without knowledge or care of who was watching him. When I look at this photograph of my brother I feel as though I could walk right into that very moment. Though I was not around when this photo was taken, I find myself able to react to it as if I had been a part of the experience myself. There is little to distract me from my brother’s perspective of the moment, because his highchair is made out of plain brown wood, and the wall behind him is white. The intimacy of the moment is inviting to me as I feel it would be to anyone, because there is a warmth and simplistic nature easily understood as the happiness of youth. My eyes linger on this photo each time I view it because along with the simple warmth of my brother’s expression, is an aspect of mystery. I will always wonder at what I cannot see in this photo. The mystery of the unknown gives the photo a depth that is invisible to the careless observer, but striking to anyone who ventures even a moment’s consideration of the aberration it elicits. While I love to look at photographs from my past, none have struck me in the way that this image of my brother does every time. To be able to connect with a moment in someone else’s life from just one image of them is incredible, and seldom possible. So many truths are expressed in this one photo, that I feel no written description could do it justice. I realize now that I am extremely lucky to understand the value of this singular photograph, when so many unimportant images flash before my eyes each day. Writing is my tool for understanding the feelings I get from simple everyday experiences. I find now that it has the power to give luster and meaning to what would otherwise remain blurred by the myriad of unimportant images begging to steal my attention. Relationships of all kinds are difficult, but I believe long-lasting friendships can be incredibly hard to maintain at a young age. I just graduated from college and my brother pointed out to me that many of the friends I made there will slip away over time. I didn’t want to agree with this, but in reality I know it’s inevitable. There are so many reasons why even close friendships fizzle out, but change, one of the most obvious reasons is often overlooked or underappreciated for the role it plays. My family expects change from me because it is all I have done since the day I was born. I have grown up before their eyes, and they have tried to influence me toward making the right decisions in life. Though I may not have turned out the way they anticipated, I still have many things to learn and a lifelong journey of transformations to go through. Very few people have friends who they have known from birth. Instead we meet the majority of our friends as we go through different shared life experiences together, like starting a new job or moving into college dorms. Friends meet at varying times in life and therefore different stages of their own identity. I think the main problem with failed friendships or relationships of any kind, is the basis for which that relationship was formed. It seems to me that too many friendships are made based upon surface level identity, when really we should be getting to know these “close” friends on a deeper level. Since people are bound to change over time, maybe we should be looking at the core of our friends rather than who they are in one moment of their life. The core of a person, being the things that have made them who they are in the present moment as well as who they were in the past. I’m not saying we should give all our friends the third degree, but before we label a person our best friend we should love them for the reasons they change. Magic is real! It is every unique memory, thought, and experience shared between yourself and a loved one. You are unaware for a while of its affect on you, but eventually you have knots in your throat leading down to a heart you never realized was so powerful. This bond is rare and it can be turned against you just as rapidly as it formed. It’s beautiful because there is no stronger bond, but dangerous for the very same reason. It gives you a reason for life, and sometimes seems to take it away. Everyone’s magic is different but mine came from the creativity and love of my mother. Its springtime and I’m very young sitting on my living room couch. The doorbell rings and mom tells me I should answer it. When I open the door no one is there. However, I push open the screen door to check for a package and instead I find something infinitely better. There hiding behind the door is a medium sized surprise! A troll with its beady little eyes calling to my greedy little heart. This event seeps into the very pores of my skin and I feel loved. Even at that young age this present meant much more to me than any other. It was the experience more than the object which connected with my heart, and that is why I can still remember that day long after the troll itself was gone. It’s winter and I haven’t been feeling very well so I come downstairs for some lunch and my mom has prepared my favorite, tomato soup and crackers. She also hands me a movie called The Secret Garden and together we snuggle up with some soup and watch the movie as the snow falls quietly outside. On that day it could have just been us two in the whole world because that’s how close I felt to her, and how much her love thrilled and encompassed me. These are just two of the many childhood memories I will never forget. Though they may seem simple and unworthy of such praise, to me each day spent with my mother had the power to be as special as the rarest diamond. I loved the way she called me jewels and tickled me whenever I passed her, or standing on a stool next to her as we brushed our hair together. I love all the smiles she has ever given me, even if they are somewhat harder to illicit nowadays. I never feel the need to keep things from her, and there truly isn’t a thing I wouldn’t tell her because I know she will always love me. As I’ve grown older and life has become more complicated I realize more and more how hard it would be without her. Though I’ve met some truly amazing people and more are sure to come, I have yet to encounter anyone who is better to talk to than my mom. She knows all the good and bad in me, and I know the same in her. Now is my chance to create some magic for her and I hope this blog does just that.